These prisoners of war worked in various labor camps. Some were originally from Bessarabia and Northern Bukovina [ citation needed ], which were occupied by the Soviet Union in 1940, some were from Romania proper. A labor camp or work camp is a simplified detention facility where inmates are forced to engage in penal labor as a form of punishment under the criminal code. Labour camps have many common aspects with slavery and with prisons. Conditions at labor camps vary widely depending on the operators. Bessarabia is a historical region in Eastern Europe, bounded by the Dniester river on the east and the Prut river on the west. Today Bessarabia is mostly part of modern-day Moldova, with the Ukrainian Budjak region covering the southern coastal region and part of the Ukrainian Chernivtsi Oblast covering a small area in the north. Bukovina is a historical region, variously described as in Central or Eastern Europe. The region is located on the northern slopes of the central Eastern Carpathians and the adjoining plains, today divided between Romania and Ukraine. Karlag was one of the largest Gulag labor camps, located in Karaganda Oblast, Kazakh SSR, USSR. It was established in 1931 during the period of settlement of remote areas of greater USSR and its' ethnic republics. Cheap labor was in high demand for these purposes. Hundreds of thousands of inmates were creating wealth for the nation for a mere bowl of soup a day. People were arrested and transported from the West of the Aral Mountains to the gigantic labor camp in Central Kazakhstan spanning from Akmola Region in the North to the Chu River in the South. Later, after WWII, another wave of "enemies of the people" poured in from newly added territories. These were immigrants and Soviet POW's captured by Hitler's army and later "liberated" by the Soviet Army. An enormous part of Karlag inmates were political prisoners - "enemies of the people" who were victims of the Article 58 RSFSR. Over a 1,000,000 inmates served in total in Karlag over its history. Vorkuta is a coal-mining town in the Komi Republic, Russia, situated just north of the Arctic Circle in the Pechora coal basin at the Usa River. Population: 70,548 (2010 Census); 84,917 (2002 Census); 115,646 (1989 Census). Norilsk is an industrial city in Krasnoyarsk Krai, Russia, located above the Arctic Circle, east of the Yenisei River and south of the western Taymyr Peninsula. It has a permanent population of 175,000. With temporary inhabitants included, its population reaches 220,000. The Tudor Vladimirescu Division was a Soviet-organized division of Romanians that fought against Germany and Hungary during the final year of World War II. 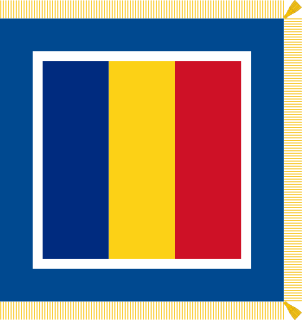 Nicolae Cambrea (1900–1976) was a Romanian Brigadier-General during World War II. In 1942, heserved as Chief of Staff 5th Division. 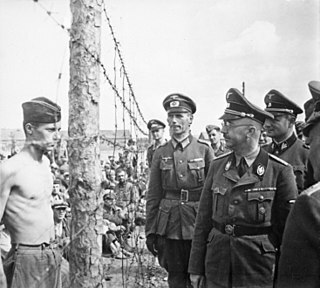 He was briefly a Soviet prisoner of war, but the following year joined his captors and became General Officer Commanding of the Tudor Vladimirescu Division. He was Vice Chief General Staff in 1945, Deputy General Officer Commanding 2nd Military Region in 1947, Commandant Army Instruction Center in 1948, and General Officer Commanding 3rd Military Region in 1949. Cambrea retired in 1950. 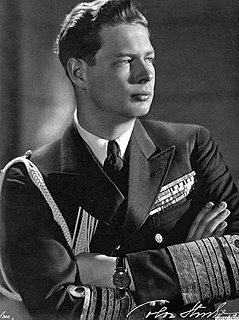 King Michael's Coup was a coup d'état led by King Michael I of Romania during World War II on 23 August 1944. 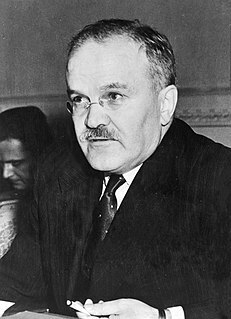 With the support of several political parties, the king removed the government of Ion Antonescu, which had aligned Romania with Nazi Germany, after the Axis front in northeastern Romania collapsed in the face of a successful Soviet offensive. The Romanian Army declared a unilateral ceasefire with the Soviet Red Army on the Moldavian front, an event viewed as decisive in the Allied advances against the Axis powers in the European theatre of World War II. The coup was supported by the Romanian Communist Party, the Social Democratic Party, the National Liberal Party, and the National Peasants' Party who had coalesced into the National Democratic Block in June 1944. Wikisource is an online digital library of free content textual sources on a wiki, operated by the Wikimedia Foundation. Wikisource is the name of the project as a whole and the name for each instance of that project ; multiple Wikisources make up the overall project of Wikisource. The project's aims are to host all forms of free text, in many languages, and translations. Originally conceived as an archive to store useful or important historical texts, it has expanded to become a general-content library. The project officially began in November 24, 2003 under the name Project Sourceberg, a play on the famous Project Gutenberg. The name Wikisource was adopted later that year and it received its own domain name seven months later. The project has come under criticism for lack of reliability but it is also cited by organisations such as the National Archives and Records Administration. Granite is a common type of felsic intrusive igneous rock that is granular and phaneritic in texture. Granites can be predominantly white, pink, or gray in color, depending on their mineralogy. The word "granite" comes from the Latin granum, a grain, in reference to the coarse-grained structure of such a holocrystalline rock. Strictly speaking, granite is an igneous rock with between 20% and 60% quartz by volume, and at least 35% of the total feldspar consisting of alkali feldspar, although commonly the term "granite" is used to refer to a wider range of coarse-grained igneous rocks containing quartz and feldspar. The President of Romania is the head of state of Romania. The President is directly elected by a two-round system for a five-year term. An individual may serve two terms. During his/her term in office, the President may not be a member of any political party. Ion Iliescu is a Romanian politician who served as President of Romania from 1989 until 1996, and from 2000 until 2004. From 1996 to 2000 and from 2004 until his retirement in 2008, Iliescu was a senator for the Social Democratic Party (PSD), of which he is honorary president. Moldavian Soviet Socialist Republic, also known to as Soviet Moldavia or Soviet Moldova, was one of the fifteen republics of the Soviet Union which existed from 1940 to 1991. The republic was formed on 2 August 1940 from parts of Bessarabia, a region annexed from Romania on 28 June of that year, and parts of the Moldavian Autonomous Soviet Socialist Republic, an autonomous republic within the Ukrainian SSR. The Soviet deportations from Bessarabia and Northern Bukovina took place between late 1940 and 1951 and were part of Joseph Stalin's policy of political repression of the potential opposition to the Soviet power. The deported were typically moved to so-called "special settlements" (спецпоселения). Italian prisoners of war in the Soviet union is the narrative of POWs from the Italian Army in Russia and of their fate in Stalin's Soviet Union during and after World War II. Mircea Aurel Vulcănescu was a Romanian philosopher, economist, ethics teacher and sociologist. Undersecretary at the Ministry of Finance from 1941 to 1944 in the Nazi-aligned government of Ion Antonescu, he was arrested in 1946 and convicted as a war criminal. The Soviet occupation of Bessarabia and Northern Bukovina was the military occupation, by the Soviet Red Army, during June 28 – July 4, 1940, of the Romanian regions of Northern Bukovina and Hertza, and of Bessarabia, a region under Romanian administration since Russian Civil War times. These regions, with a total area of 50,762 km2 (19,599 sq mi) and a population of 3,776,309 inhabitants, were subsequently incorporated into the USSR. Amicii URSS was a cultural association in interwar Romania, uniting left-wing and anti-fascist intellectuals who advocated a détente between their country and Joseph Stalin's Soviet Union. Created in the spring of 1934 by Petre Constantinescu-Iași, an activist of the previously outlawed Romanian Communist Party, the society took its inspiration from the French Amis de l'URSS and from the worldwide network. Actively encouraged and financed by the Comintern, Amicii URSS was viewed with suspicion by authorities — never officially registered, it was eventually banned on the orders of Premier Gheorghe Tătărescu on November 25, 1934. It ceased its activity after that point, but constituted a precedent for the Romanian Society for Friendship with the Soviet Union (ARLUS). Danylo Lavrentiyovych Shumuk was a Ukrainian political activist who served a total of 42 years imprisoned by three different states, Second Polish Republic, Nazi Germany and Soviet Union. Igor Caşu is a historian from the Republic of Moldova. Vasile Soare is a Romanian diplomat. He served as Romanian Ambassador to Kazakhstan, Kyrgyzstan, and Tajikistan (2002–2008). The Romanian Volunteer Corps in Russia, or Volunteer Corps of Transylvanians-Bukovinans, was a military formation of World War I, created from ethnic Romanian prisoners of war held by Russia. Officially established in February 1917, it comprised abjurers of the Austro-Hungarian Army, mainly contingents from Transylvania and Bukovina. These had been obliged to fight against Romania, and, once in Russian custody, volunteered for service against the Central Powers. As campaigners for self-determination and union with Romania, they passed political resolutions which, in both tone and scope, announced those adopted on Union Day 1918.